"Yellow-Dog Democrat," a popular term sometimes applied to ultra-loyal supporters of Democratic candidates for public office, came into use in the third decade of the twentieth century. 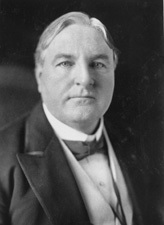 In 1928 Democratic senator Tom Heflin of Alabama supported Republican Herbert Hoover in his campaign for the presidency. Heflin's detractors, in response to his defection, declared that they would vote for a "yellow dog" before they would cast a ballot for a Republican. The term, used as both a compliment and an insult, has continued to appear in North Carolina political speech. Wilson, Reid. "Death of the 'Yellow Dog' Democrat." National Journal. August 25, 2011. http://www.nationaljournal.com/columns/on-the-trail/death-of-the-yellow-dog-democrat-20110825 (accessed September 18, 2012). "Jim Long, Insurance Commissioner and NCPP Board Member, Receives Honors." NC Prevention Partners Changing Lives. Fall 2008. http://www.ncpreventionpartners.org/ncpp/Document/Download?id=fcbb6590-d3f5-410c-a574-a644e418a0e6 (accessed September 18, 2012). "Democrats to honor Charles Malone." The Clayton News-Star. July 12, 2012. http://www.newsobserver.com/2012/07/21/2212953/club-notes.html (accessed September 18, 2012). "HEFLIN, James Thomas, (1869 - 1951)." Image from the Biographical Dictionary of the United States Congress. http://bioguide.congress.gov/scripts/biodisplay.pl?index=H000446 (accessed September 18, 2012). Could you guys make it more interesting and easy? I never knew where that term came from. There are actually a few political terms that I think are awesome. My sister lived in NC for a while so she heard that term a lot more then I have.